This is a dish I have always taken for granted. My maternal grandmother and aunts used to cook it, and my mom cooks it too. It’s always been just another one of our home-style dishes. In my family, we refer to it as Si Yew Bak. In Teochew, which is the dialect of my maternal grandparents, dark soya sauce is referred to as si yew, whereas in Hokkien, it is tau yew. Bak means “meat” in both Teochew and Hokkien. As this is actually more of a Hokkien dish, it is more commonly known as Tau Yew Bak. It now occurs to me that this Si Yew/Tau Yew conflict speaks of my own identity crisis over my dialect group. I am officially Hokkien, because my Dad’s father was Hokkien. However, my late Mama (my Dad’s mother) was Teochew. She spoke Teochew to us. My Dad’s father had passed on by the time I was born. As a result, I never had to learn to speak Hokkien properly. And any Hokkien I try to speak usually comes across sounding more like Teochew. Anyway, my version of Tau Yew Bak is actually sweeter than my mom’s. It’s really easy to do, and it’s always been a hit with friends with whom I’ve shared either the dish itself or its recipe. Very kid-friendly too – my kids never complain about eating steamed white rice when its doused in the gravy. Rub salt over pork and rinse off. In a small wok or saucepan, melt sugar on low heat until caramelised then add dark soya sauce and water (be careful not to let the sugar burn and turn bitter). Add pork, garlic, cinnamon and star anise, bring to a boil and simmer 30 minutes. You may add the boiled eggs and tau kwa at this stage, and continue to simmer until pork has softened, turning eggs and tau kwa midway if they are not completely submerged in the gravy. Note: This dish actually tastes better when it’s cooked the day before. To spice it up a little, you may add a dried chilli or 2 into the pot together with the pork and other ingredients. My friend C, who’s taking a break from work to spend time with her toddler, has asked that I share some Chinese home-style dishes she can prepare for the family. I know what it’s like having to cook dinner while minding a small child, because we only had live-in help about 3 years after the daughter was born. Before that, quick, healthy meals which required minimal cleaning up were the order of the day. Now weekday meals are usually left to W, our Filipina helper. I go through the week’s menu and shopping list with her, and unless we feel like having something special, I don’t have to bother her in the kitchen for the rest of the week. As a source of reference for W, we keep a couple of ratty, torn notebooks containing scribblings of recipes I’ve given her over the years. Most of the time, it’s comforting Chinese home-style dishes which I am grateful to be able to come home to. One of my comfort foods is Mee Sua Soup. Pork Rib and Yam Mee Sua Soup and Fish Mee Sua Soup are part of our regular diet at home. 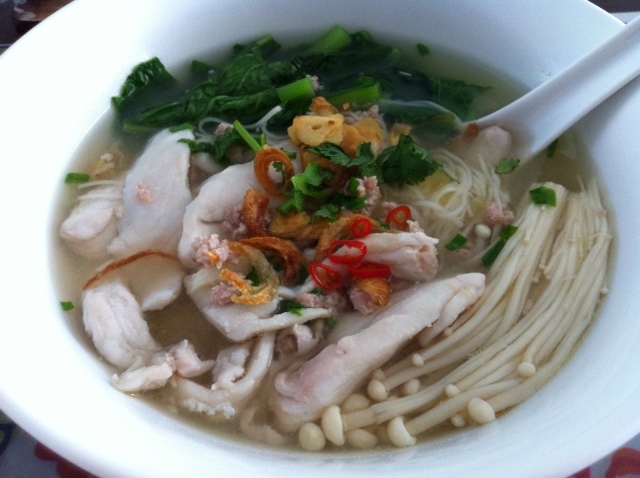 Mee Sua is a fine rice noodle with a very delicate, smooth texture. I especially love the way it glides down the throat so wonderfully when eaten as part of a soup dish. It also has a sweeter and more delicate taste as compared to bee hoon. We haven’t had much Chinese home-style cooking in the past few weeks. So yesterday’s lunch of Fish Mee Sua Soup was such a welcome sight to me. This comforting one-dish meal is tasty, healthy, easy to prepare, and entails minimal kitchen-cleaning afterwards. Season the minced pork with sesame oil, soya sauce and white pepper. Season fish slices with salt, hua teow chiew and sesame oil. Bring stock to a boil in a pot with the ginger, garlic and kiam chye. Put seasoned minced pork in a large bowl, add about a ladle of stock into the bowl and quickly stir with a fork or chopsticks to separate the minced pork into loose bits as they cook partially, then pour the mixture into the pot to cook, stirring gently. Add mushrooms into the pot to cook, then remove and set aside. Add fish slices into the pot and remove and set aside when just cooked (submerge into the pot a small sieve with a handle and cook the fish over it, so the slices are easier to retrieve). Add tomato into the soup and simmer perhaps 2-3 minutes. Season soup with salt and pepper if necessary. In a separate saucepan/pot of salted boiling water, blanche the chye sim till just cooked. Remove and set aside. Cook mee sua in a pot of boiling water, one portion at a time, over a sieve, gentling moving the noodles apart with a fork or chopsticks to keep them from sticking together (1 to 1.5 lumps mee sua per portion would be about right). Once mee sua is tender (which doesn’t take long), remove from pot by lifting the sieve (hence draining it at the same time), transfer into a bowl. Put one portion of fish, mushroom and vegetables over the mee sua, in each bowl, and pour soup over it. Top with fried shallots and garlic and garnish with spring onion and Chinese parsley and serve with a small saucer of chill padi and soya sauce. Note: You could add a tbs of toasted hei bee (dried shrimp) to the stock for even more flavour (and omit the kiam chye), or add some dried seaweed to the soup.